The iPRG study (via ABRF) allows researchers to benchmark against one another in their ability to accurately identify peptides. The regular study allows multiple search engines to be used to identify the maximum amount of peptides. While it is encouraged to utilize multiple engines for daily analysis, it makes identifying the contributions made by each database search engine unclear. The charts below present a streamlined version of the chart produced by the iPRG study (slide 26) with respect to cases where only researchers employed only one peptide identification method in order to give a clear view of independent findings. Researchers using PEAKS software performed excellently and identified a considerably high quantity of peptides with a very low false discovery rate (FDR). 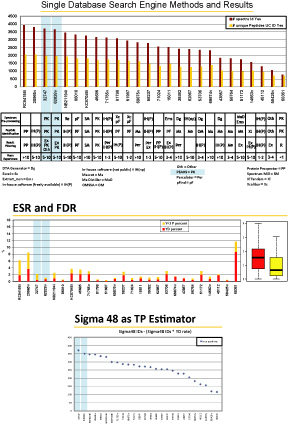 This is just another study illustrating the exceptional capability of PEAKS software in providing a combination of high peptide identification rate and low FDR from database searching. These slides demonstrate highlights of the study. People were generally over-optimistic about how reliable their results were (FDR underestimation). View highlight slide 2 or official slide 32. Experience with tools was thought to have contributed significantly to the success of a lab’s results. To make sure you are getting the most out of PEAKS, click here for more details about PEAKS’ training webinars.